Passover is an opportunity for Jewish families to gather, pray and argue about politics. That last activity isn’t part of the official rituals, but it may be hard to avoid this year. An election in Israel, President Donald Trump’s remarks to the Republican Jewish Coalition and congressional efforts to address anti-Semitism have exposed discord in the American Jewish community. Jews disagree on Trump’s presidency, the best path forward for Israel and whether the Democratic Party has done enough to support religious minorities. 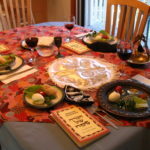 At Passover, which begins April 19 this year, some Jews try to set politics aside, focusing instead on familial harmony. “Passover is for celebrating the transcendent, the mysterious, the eternal, not rehashing worn-out political debates. It is a night to find new meaning in an old script, not to force the text into a preconceived political platform,” wrote Shmuel Rosner, a Jewish journalist, for The New York Times in 2017. And yet other Jews see this holiday as a call to root out injustice in the world. In recent years, reflections on the Israelites’ escape from Egypt merged into discussions on the refugee crisis and immigration policies. This edition of ReligionLink highlights Jewish leaders and scholars who can speak about the role politics plays in Passover celebrations. Read “How Netanyahu’s win could further polarize American Jews” from Religion News Service on April 10, 2019. Read “Trump replaces God in grateful Republican Jews’ Passover song ‘Dayenu’” from The Forward on April 8, 2019. Read “Pro-Trump Republicans plan big-money play for the Jewish vote in 2020” from Politico on April 7, 2019. Read “Pushing for tighter borders, Trump asks Jews for support” from The New York Times on April 6, 2019. Read “Progressive Jewish group protests Trump’s Republican Jewish Coalition speech” from The Hill on April 6, 2019. Read “Building bridges at Passover” from Tablet on March 25, 2019. Read “Trump and the GOP are trying to make ‘Jexodus’ happen, but most Jews still vote Democratic” from The Washington Post on March 15, 2019. Rabbi Jacob Blumenthal leads Shaare Torah, a synagogue in Gaithersburg, Md. In July 2019, he will become chief executive of the Rabbinical Assembly, an international association for conservative rabbis. Contact: rabbijacob@shaaretorah.org, 301-869-9842 ext. 111. Matthew Brooks is the executive director of the Republican Jewish Coalition, a political organization working to strengthen ties between the Republican Party and American Jews. Nathan P. Devir is an associate professor of Jewish studies, religious studies and comparative literature at the University of Utah, where he also directs the Middle East Center and Middle East studies program. Marnie Fienberg is the co-founder of 2 for Seder, which encourages Jews to invite at least two non-Jews to their Passover celebrations as a way to combat anti-Semitism. Her mother-in-law, Joyce Fienberg, died during the shooting at Tree of Life synagogue on Oct. 27, 2018. Jonathan Greenblatt is the CEO and national director of the Anti-Defamation League, a civil rights watchdog organization with Jewish roots. Rachel B. Gross is an assistant professor of American Jewish studies at San Francisco State University. Her research interests include American religion, Jewish history and food. Jill Jacobs is a Conservative rabbi and the executive director of T’ruah: The Rabbinic Call for Human Rights, based in New York City. She has written and spoken about Trump administration policies and rising anti-Semitism in many outlets, including The Washington Post and NPR. Arrange an interview through Julie Wiener. Rabbi Rick Jacobs is president of the Union for Reform Judaism, the central body of Reform Judaism in North America. Rabbi Jack Moline is president of Interfaith Alliance in Washington, D.C., as well as an adjunct faculty member of the Jewish Theological Seminary and the Virginia Theological Seminary. He’s spent much of his career creating common ground between people of diverse religious and secular backgrounds and speaks out often on religious freedom issues and faith-related policies. Read “American and Israeli Jews: Twin portraits from Pew Research Center surveys” from Pew Research Center on Jan. 24, 2017. Read “How the faithful voted: A preliminary 2016 analysis” from Pew Research Center on Nov. 9, 2016. Read “U.S. religious groups and their political leanings” from Pew Research Center on Feb. 23, 2016. Read “Jewish essentials: For most American Jews, ancestry and culture matter more than religion” from Pew Research Center on Oct. 1, 2013. Read “Chosen for what? Jewish values in 2012” from PRRI on April 3, 2012.